Today is our Wedding Anniversary...! To celebrate this sweet occasion, I wished to prepare my Hubby’s favorite dessert Badam Halwa, and very happy, when it turned out to be perfect. This halwa made of almonds, milk, sugar and clarified butter is a rich, scrumptious, mouth watering delicacy and quick to make. 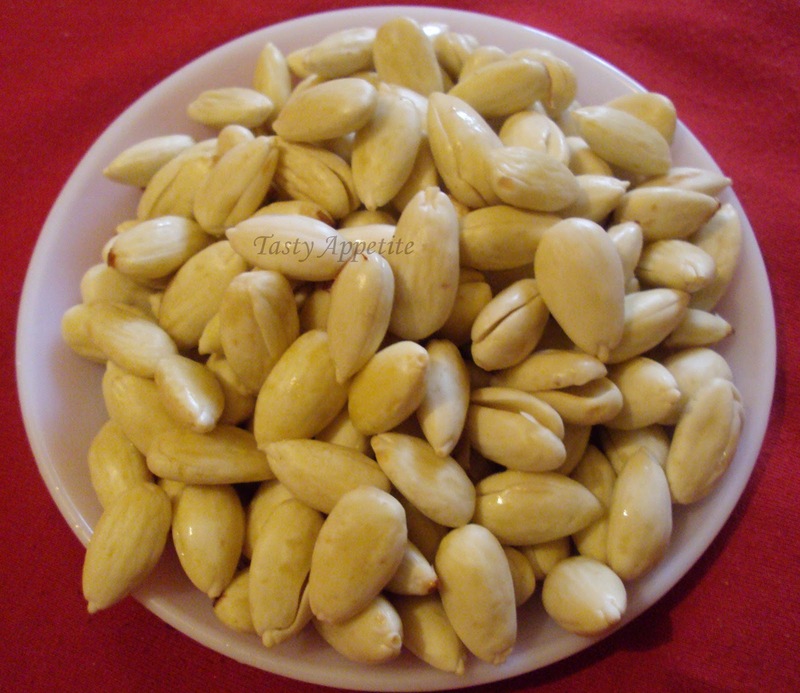 Soak almonds in hot water for ½ an hour. 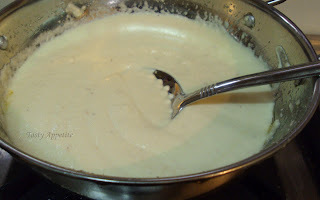 Grind to fine paste with milk in a blender. 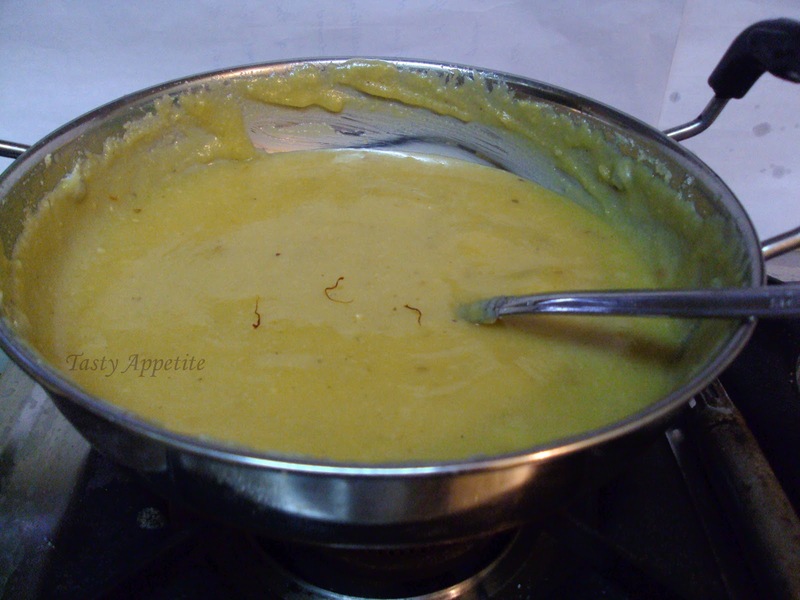 Soak saffron strands in 2 tbsp of warm milk. 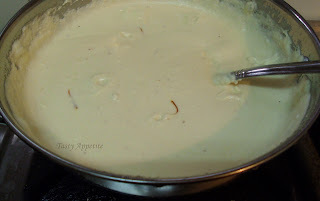 Take a non stick kadhai . 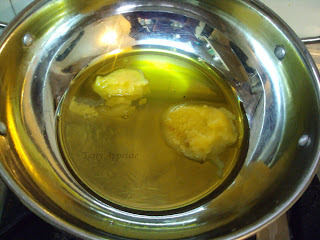 Add 4 tbsp ghee and allow to heat. 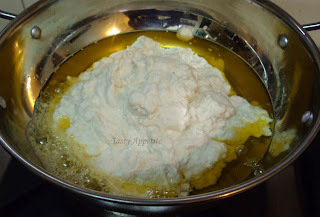 Now add almond paste and stir in low flame. Cook for 5 to 7 mins. Once it thickens, add remaining milk, saffron soaked in milk and stir well. Cook further for 3 to 4 mins or till it thickens in low flame. 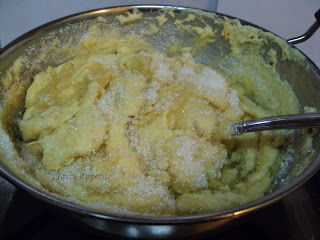 Now add sugar and cardamom pwd . Stir continuously in low flame. The sugar dissolves and the mixture turns liquid. 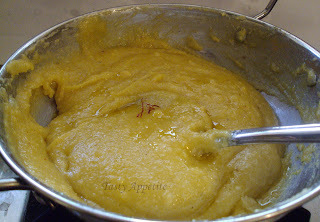 Continue stirring till the mixture thickens and attains halwa consistency. Garnish with almond slices and saffron strands. Looks really yummy Jay! Love the halwa! Happy Anniversary wishes Jay . 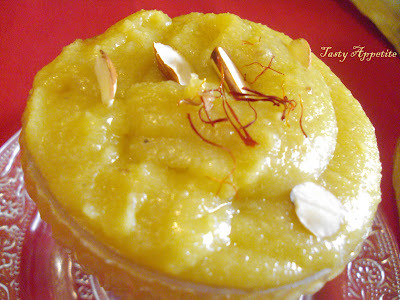 Halwa looks so yummy and delicious .. Happy Anniversary & may u have many more to come! Happy Anniversary...Irresistible & so tempting halwa. 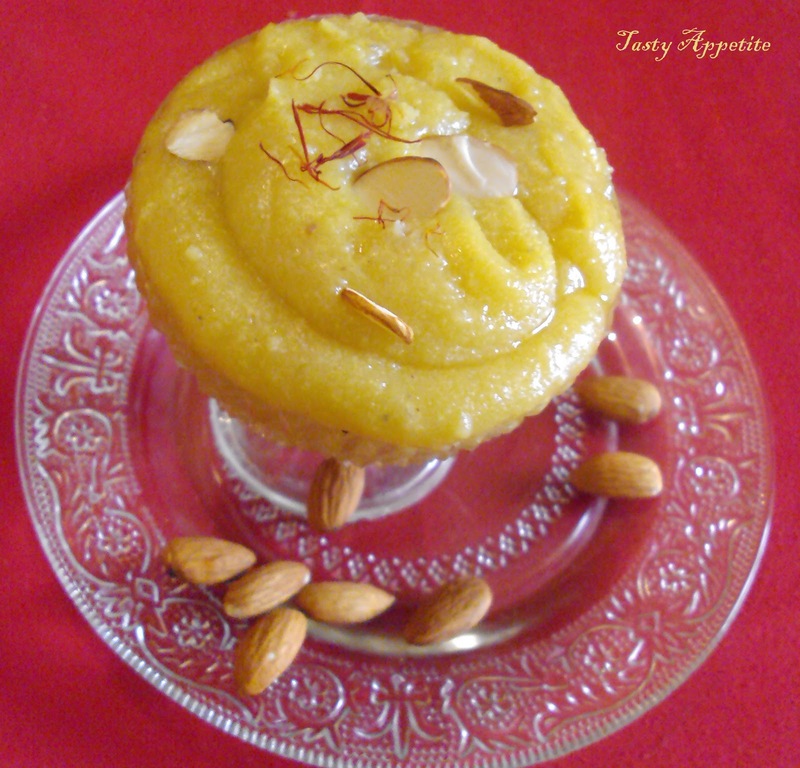 Happy wedding anniversary dear Jay..halwa looks super yummy and delicious.. Happy anniversary Jay!! Have a nice day..super halwa!! Many Many Happy returns of the DAY, Jay and Badam halwa looks absolutely stunning and delicious..
Badam halwa looks awesome! Could not take my eyes off it. Happy anniversary to you and your husband. Happy Aniversary to both of you. the smoothie looks perfect for the occasion! wishing u & ur hubby many more sweet years of happiness & togetherness ! this halwa looks out of the world--my favourite and am drooling here ! Happy anniversary Jay, just can't stop looking at this mouthwatering halwa. Happy anniversary dear Jay,..Haa..I want it..I made a Badham Burfi this week..sound like i've to make halwa 2.. Guess what? Ours is today too!!! Love the delicious halwa! !Tempting one!! Happy anniversary Halwa looks delicious. Happy Wedding Anniversary! !Halwa looks so delicious. Happy Anniversary to the happy couple! Your post is such a sweet tribute to your husband and the love you share. May you have many more happy years together. 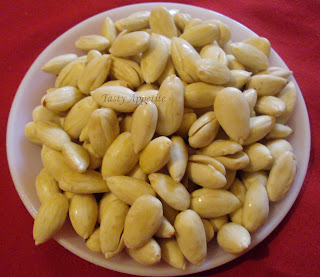 hey jay, halwa looks yummy, I love badam halwa. These step by step pics are very helpful Jay. Happy anniversary Jay. Happy Wedding Anniversary :) U have been awarded. Check out in my blog :) Keep Posting !!! Hey Congrats on you anniversary! 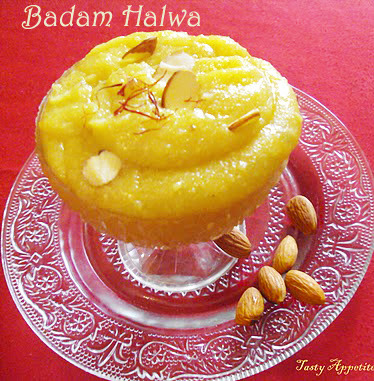 May you have many more and make fantastic badam halwa. Beautiful halwa with lovely pictures! oh!what a colour! what a presentation! superb preparation.your blog looks very yummy. my special wishes to you both jay,happy wedding anniversary. nicely presented..loved the recipe..looks so delicious..
wow, mmm.. mmm... mmmm.... slurping the whole thing. Yours is a great blog..Love all ur recipes..Thanks for stopping by mine. Halwa is just awesome. drooling here! Thanks a ton for dropping by in my blog:) Guess what 31st Jan is my parents anniversary! 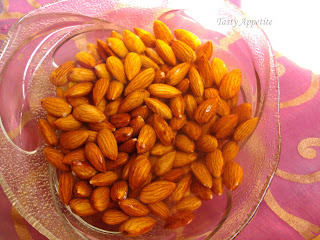 Your Badam halwa sounds sooo tasty.. and i bet Arvind will enjoy it:) Oh! Arvind is my hubby dearie! yumm yummm yummmmmm... love your blog. you can find me now in your long list of followers. happy anniversary to you. i wish you many happy years from now on. YOur comments are very valuable to me..! Hope you enjoy this dessert..Keep visiting..!! Who wouldn't love this, look super yum! how do you stay thin after testing all this! 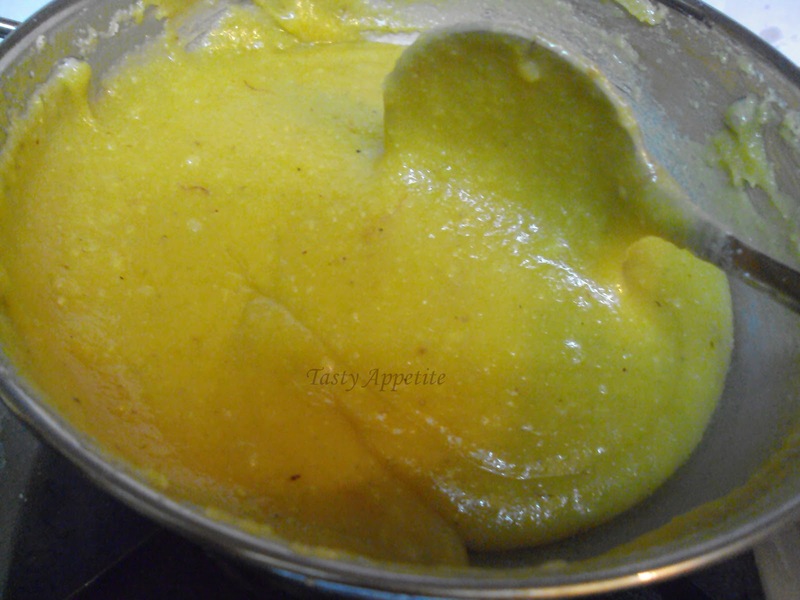 thnx Kavitha...you can check out easy carrot halwa recipe here..